AAR came and rock Malaysia again last Saturday night and I was there along my 4 other friends(Izza,her sis Izrin,Ella & Acad),right after Readings@SEKSAN. We came just in time when the 1st opening act, Disagree was about to play.Pop Shuvit,One Buck Short(Mookie was in the hospital though),Liyana Fizi,Sam Bunkface and the dude from Gerhana Ska Cinta performed.Some lame dance comp thingy that the dj’s of Fly Fm did on stage. Managed to push ourselves through the crowd,thanks to El’s wisdom..lols.Waited AAR to come on stage for about 50 minutes.Got into a tiff with some stupid first time concert goers..Word of advice,lame people who are afraid of getting packed like sardines,sweaty,pushed around and etc,don’t go to concert! They left even before AAR came on stage..losers!Oh,smoking during a concert is SO not cool.It’s hard enough for us to breath due to lack of space+BO=lack of oxygen. Tyson with his native American head gear & glittery arms came on stage and they rocked the house.He is just as energetic and fun and campy and awesome!! !It was worth the wait.I love love his performance.Met a lot of cool guys during the concert.Some very cute ones,like the Thai dude with the big hair that obstructed Izza’s view—lolss,the cute brother who hold his lil’ sis on his shoulder(wonder how the lil girl who looked 7 or 8 years old,managed to get in?) or the bunch of guys when we were behind us who shouted in a exaggerated gedik way--‘We love you tyson’..hahaha and they memorized all the lyrics yo!When the concert was about to end,we suddenly got thrown with glitter coming out of nowhere..bahaha. After the concert ended,because we were way in front,on the way out,saw a lot of familiar faces.The people from Readings were there too,said hye,took some pics.Met some of my seniors & colleagues as well.All the pics are in Ella’s camera thus I don’t have it with me. 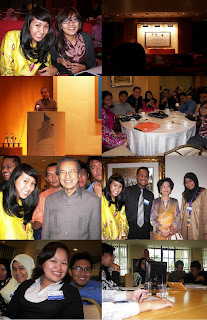 This was my 2nd time going to the discourse series.My first one was about 3 years ago and I remembered the topic was about education and Tun Dr.M had a lot more to talk about it since his well verse in that topic.This time around we could sense that the topic was not really his cup of tea. The topic this time around was The Role of Women and Youth in National Development.The panel of speakers was Dina Zaman, Tengku Zafirul and others that I can’t remember because the brochure & bag that I got is in the trunk of my car..am too lazy to take it out..ahaha. Izza went too although initially,it was for PART 8 students who took Professional Development but because there were many empty seats available,it was opened to others as well at the last minute.So it was fun sharing the experience with Izza again because the first time that I went there was with her too.Want to blog more about it but this post is becoming too long. Pisau Cukur *Hey,Mak is here! !woohooo.Miss her lots!! I watched the much anticipated movie by Bernard Chauly a few days ago and it was light,funny and made me want to go on a cruise.I’ll give the movie 3 out of 5.:)..Maya Karin has a such a fit body & I wish I could be that diligent in working out--she has muscles man! I thought that Faqir played by Shahredza Minhat is very very cute.I saw him in Impian and Mak(Farhana) said that he worked at Bank Negara cause she saw him & she has even served him rice before(long story..).. The last day of my finals made me realize that..Hey,this your LAST finals EVER!After spending almost 5 years in UiTM—1 year for Pre-Degree TESL & 4 years of B.Ed TESL--,I’ve to say that it felt like a dream .It felt like only a while ago that I experience MMS,went for the Pre-TESL interview and many many great and not so great things happened in these past 4 years & ½...So many memories was posted on this blog and most of it is tuck safely in my memory. I only have to do my practicum left, and that scares me for a number of reasons that only my close friends knows why..huhuhu.This hols won’t be much of a holiday cos’ will be busy with Willow,helping my mum run errands and drive her here and there, & I’m hoping that my dad will allow me to go camping with some friends too. Believe it or not,I actually love it because I have an excuse not to bathe during camping(the last time I went,I didn’t bathe for 2 days..hahaha) and not have to primp or wear makeup because I primp myself everyday..gahahaha. Will be abandoning this blog for a couple of days,1 week tops, because there’s so much to be done,things to do,buy,fitness(lolsss),and lots of sleeping.:)Byeee!! u might have to register to become a fanpop member..but it's free!enjoy watching! !